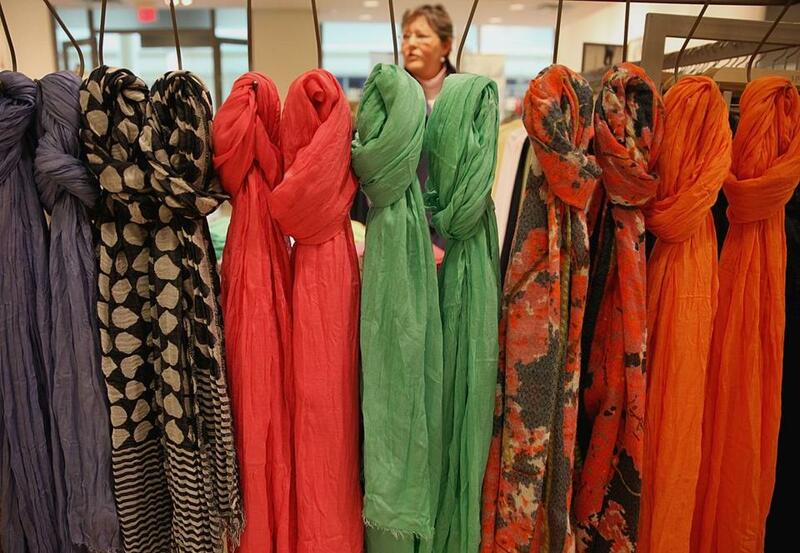 Colorful scarves were on display at the J. Jill store at the Burlington Mall, where they are rolling out the “Uncomplicate” line for spring. Picture a woman in a pale blue tunic matched with gray leggings sprawled across a cream couch reading the newspaper on a Sunday morning and you’ve got the idea behind J. Jill’s largest marketing campaign to date. The company even has a word for it: Uncomplicate. The 54-year-old company set out over the last year to build its brand as easy style and timeless fashion to appeal to a baby boomer customer base that wants more time for the things that matter most. The result can be found in a spring line of flowing linen, soft cotton, and washable silk tunics and tops with easily matched leggings, chinos, and pants to go along with simple accessories that hit stores this week. In many ways the campaign’s new buzzword — not a noun or adjective you’ll find in any dictionary — also describes the company’s attempt to find itself. 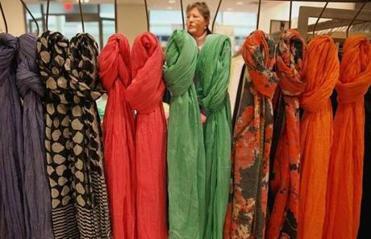 The Quincy retailer was purchased by Talbots in 2006 for $517 million and then dumped three years later for $75 million. Yet another sale to Arcapita Bank in 2011 marked the company’s fourth owner in a five-year period marred with missed earnings projections and, according to at least one analyst, a lack of clarity about who it was targeting. Claire Spofford, who led the campaign’s development with the help of advertising and public relations firm CerconeBrownCompany, sees it differently. The company said it experienced double digit revenue growth in 2012, but declined to disclose sales figures. Moody’s Investors Service upgraded J. Jill’s investment outlook to positive from stable last month. Now, Spofford said, the retailer wants to sharpen its image. “The issue was that we were just a little bit quiet and we weren’t as bold and confident about what we had to offer,” said Claire Spofford, J.Jill’s chief marketing officer. 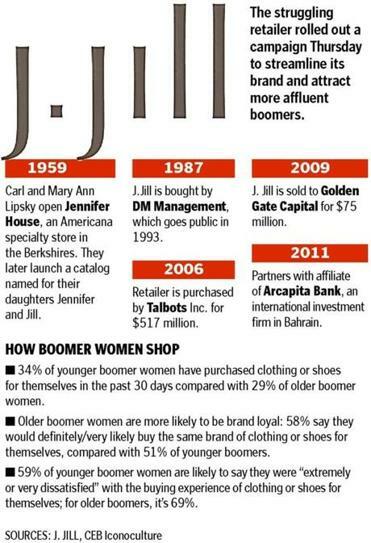 Marshal Cohen of NPD Group, a market research firm in New York, applauds J. Jill’s effort to openly cater to the growing boomer demographic. He said a quarter of all consumers will be 60 or older by 2015. Traditional marketing rules suggest women spend less on fashion and more on categories such as home improvement and home goods once they reach child bearing years. But Cohen said boomer women have just as many lifestyle changes to prompt wardrobe overhauls as the twenty­somethings the clothing industry focuses on. They become empty nesters and find second careers, and in some cases, second husbands. “They have the most discretionary income, the biggest spending power and need to transition their wardrobe,” Cohen said. The tricky part is connecting with the consumer and not making the brand seem old and, in turn, obsolete. A year ago J. Jill embarked on a three-pronged research project to do just that. A tracking study combined with a detailed customer database from decades as a catalog company gave the retailer insight into awareness of the J. Jill brand and demographic information on clients, including age and spending history. The second piece involved conversations with retail analysts who track 45- to 64-year old-women and others who follow fashion to understand how to apply the latest trends to their customers. The final step — and the most telling element to the marketing team — brought together focus groups of about 60 current and former customers in Boston, Chicago, and San Francisco. “We had them come in wearing their favorite outfit, whether it was J. Jill or not, and then talk about why they loved it,” said Spofford. Most described their outfits as go-to favorites — versatile styles that were easy to match and dress up or down. Beyond fashion, the interviews revealed that J. Jill’s target customer wants to make time in her life for things that are most important, such as family and friends, and not stress the rest. 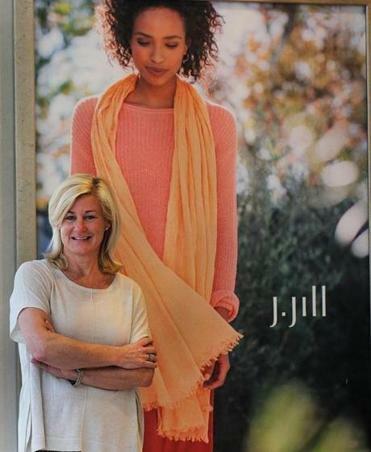 Tesler said J. Jill’s new more flexible mix-and-match attire, as found in some of the “Wearever” items that are already in store, and approach to fashion are catching on. Taryn Luna can be reached at taryn.luna@globe.com.